Garter encircled arms of John Winston Spencer-Churchill, 7th Duke of Marlborough, KG, as displayed on his Order of the Garter stall plate in St. George's Chapel. John Winston Spencer-Churchill, 7th Duke of Marlborough, KG, PC (2 June 1822 – 4 July 1883), styled Earl of Sunderland from 1822 to 1840 and Marquess of Blandford from 1840 to 1857, was a British Conservative cabinet minister, politician, peer, and nobleman. He was the paternal grandfather of Prime Minister Sir Winston Churchill. John Spencer-Churchill was born at Garboldisham Hall, Norfolk, the eldest son of George Spencer-Churchill, 6th Duke of Marlborough, and Lady Jane Stewart, daughter of Admiral George Stewart, 8th Earl of Galloway. He was educated at Eton College and Oriel College, Oxford. Spencer-Churchill was Member of Parliament for Woodstock from 1844 to 1845 and again from 1847 to 1857. He was responsible for the "Blandford Act" of 1856, enabling populous parishes to be divided for purposes of Church work. In 1857 he succeeded his father in the dukedom and entered the House of Lords. 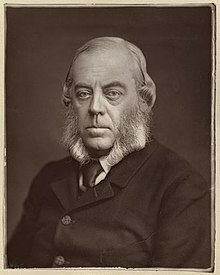 He served under Lord Derby as Lord Steward of the Household from 1866 to 1867, and under Derby and later Benjamin Disraeli as Lord President of the Council—with a seat in the cabinet—from 1867 to 1868. He was an influential Freemason; he was sworn of the Privy Council in 1866, and made a Knight of the Garter in 1868. On the formation of Disraeli's second cabinet in 1874, he was offered, but declined, the Viceroyalty of Ireland. He again held office under Disraeli as Lord Lieutenant of Ireland from 1876 to 1880. Spencer-Churchill was president of the Shipwrecked Fishermen and Mariners' Royal Benevolent Society for many years. He died suddenly of angina pectoris at 29 Berkeley Square, London, on 4 July 1883. After lying in state at Blenheim Palace, he was buried in the private chapel on 10 July. Lord Randolph Henry Spencer-Churchill (13 February 1849 – 24 January 1895), married 15 April 1874 Jennie Jerome. Their issue included Sir Winston Churchill and John Strange Spencer-Churchill. Lady Rosamund Jane Frances Spencer-Churchill ( 9 Nov 1851- 3 December 1920), married 12 July 1877 William Fellowes, 2nd Baron de Ramsey, by whom she had issue. Lady Sarah Isabella Augusta Spencer-Churchill ( 4 Jul 1865 – 22 October 1929), a war correspondent during the Boer War; married 21 November 1891 Lt. Col. Gordon Chesney Wilson (son of Sir Samuel Wilson, MP), by whom she had issue. Marlborough died on 4 July 1883, aged 61, and was succeeded in the title by his eldest son, George. His wife died sixteen years later, on 16 April 1899, aged 77. Marlborough was portrayed by Cyril Luckham in the 1974 Thames TV mini-series Jennie: Lady Randolph Churchill. ^ One or more of the preceding sentences incorporates text from a publication now in the public domain: Chisholm, Hugh, ed. (1911). "Marlborough, Earls and Dukes of" . Encyclopædia Britannica. 17 (11th ed.). Cambridge University Press. p. 737. ^ Churchill, Lord Randolph. "Churchill Freemason". Churchills who were Freemasons. freemasons-freemasonry/com. Retrieved 30 July 2012. This article incorporates text from a publication now in the public domain: Boase, George Clement (1887). "Churchill, John Winston Spencer". In Stephen, Leslie (ed.). Dictionary of National Biography. 10. London: Smith, Elder & Co.
Wikimedia Commons has media related to John Spencer-Churchill, 7th Duke of Marlborough. This page was last edited on 12 February 2019, at 23:05 (UTC).